Podcasts have become a mainstay in my ears now while I travel, not just internationally but on the train in Berlin, while making dinner, while cleaning up after my messy self, and while out for an evening stroll. Podcasts usually help me learn something and entertain me simultaneously, and I can listen to them offline. Double win. I’ve listened to and been a guest on several travel podcasts. Sometimes they’re great and sometimes I want to slip off into a boredom-induced coma when I listen (even to myself, I hate to say), so when KLM reached out to ask if I’d be interested in sharing their podcast, I wondered what they had to offer that would be different. This podcast is a delight to listen to. It transports you with the sounds, emotions, voices, and even the feelings that the person was feeling at the time. The combination of the fantastic people chosen to be on the podcast and the production quality make it engaging. I feel connected to each person, even though so far, they’ve been totally different. There’s always something relatable. The first podcast to come out was of Linda Nijlunsing who moved deep into the Alaskan wilderness to follow adventure, and eventually, love as well. Listening to her was like watching a movie in a theater, transported to Alaska, a place that I’ve been to before but even if I hadn’t, the sounds and vivid descriptions could have painted a perfect picture anyway. I don’t want to spoil it but her bluntness had me laughing at first, then the stories of the crazy things she experienced and lived through in the wilderness had me on the edge of my seat (well, had I been in one, but truth be told I listened to it in the bathtub). There were times when I was heartbroken for her, and in the end I felt like I just wanted to meet and have coffee with this woman. All this during a 30 minute bath while shaving my legs. I truly did feel like I was on a journey. So after that I was like yeah KLM, I’ll help you promote this. More people need to hear this woman’s story, and buy her book. And have coffee? Linda could we please have coffee sometime? You can listen to the podcast episode here. The second episode from Samba Schutte recounts an incredibly diverse and varied childhood which ultimately made him an outsider in many respects. Through this, he found his way to relate to people as a comedian. However it was during his stay in a remote Kenyan village, with nothing but the very basics of survival, that he found his true calling. I loved how his story showed that the times that were difficult for him were also the most enriching. His international background is what gave him such a leg up in the comedy world – he had an amazing story and the talent to make it work for him using comedy. However his biggest journey would be the search for spreading his message even wider by heading to Los Angeles to try his luck in a much bigger audience than in Holland, his adulthood home. You can listen to the podcast episode here. I’m looking forward to the next few episodes. The story of a city woman who changes directions entirely comes out tomorrow. 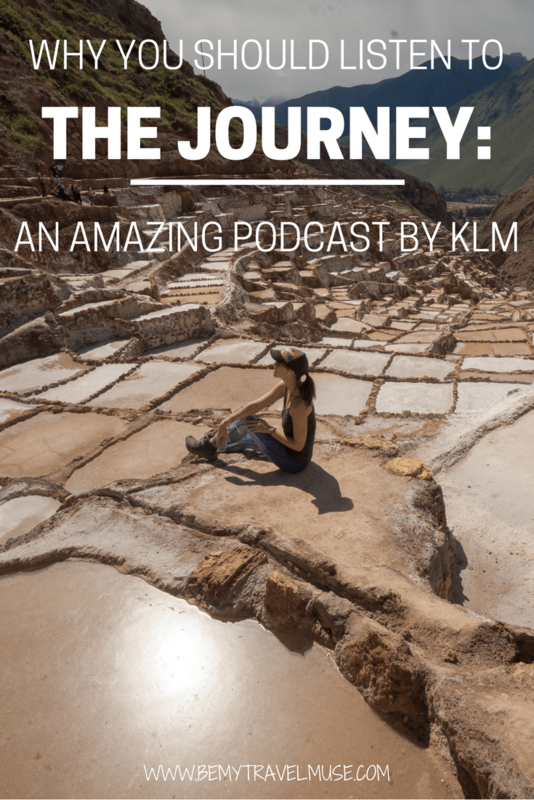 So far, the episodes of The Journey by KLM have been about the journey not just to a remote place, but the moments when people made a huge change and went forward doing things that most people thought they were crazy for attempting. They used their weaknesses as their greatest gifts. I found it moving and inspiring. FYI, I know a lot of you have amazing stories to tell – you can also apply to be a guest on the podcast! You can find out more about the podcast here, and listen to new episodes each week. *This post was brought to you in partnership with KLM, all thoughts are my own. I only agreed to promote this podcast because I genuinely enjoyed it! Unbelievable, how did I not know about this? Both as a Dutchie and as an avid KLM passenger. The stories in the podcast sound really interesting and inspiring. I’ll definitely start following them! No way! Let’s do it!